Real change for yourself, your community, and your world starts here. Through hands-on experience, the Jewish Teen Foundation (JTF) is a Federation program that fosters teens to be more self-aware and empathetic, igniting a life-long passion to help others. Watch Alex’s story to see how this program impacted her life. The Jewish Teen Foundation is open to Bay Area local, Jewish-identifying, 9-12th graders (and 10-12th for leadership positions) who want to better understand the world, the people that inhabit it, and the ideas that can improve it. Working collaboratively with like-minded peers driven by shared Jewish values, teens get energized by addressing their generation’s major social issues, all while exploring concepts, finding meaning, and expanding their horizons. Teens who have previously participated in JTF are welcome to apply either as a participant or a Leadership Council member. Leadership positions require at least one year of participation in JTF or equivalent leadership and/or management experience. The 2019-2020 online application opens on Monday, April 15, 2019. Can teens make choices based on their interests? Dives into the world of Jewish philanthropy as members of a teen-driven foundation board, fundraising and grantmaking locally-raised dollars to address critical local and international community issues. Delves into pressing societal issues, seeking an in-depth understanding to identify creative solutions in partnership with local and international organizations. The program lasts from September to May, approximately 9 months. An orientation for families is followed by a weekend-long Training Conference at Walker Creek Ranch. After the conference, the Philanthropy and Civic Tracks begin their independent work while still interacting multiple times throughout the year. Communicate - Inform selected nonprofits about the awarded funds and discuss the future of their project. The Jewish Teen Foundation is guided by an experienced group of participants in leadership roles called the Leadership Council. Throughout the year, teens will identify their own leadership aptitude, gain knowledge from one another, and hone their new skills within their chosen track. 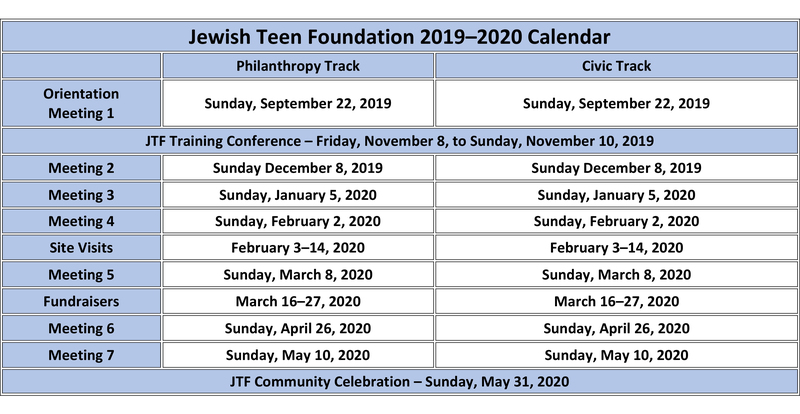 The JTF Advisory Committee collaborates with JTF staff on key areas that support the excellence and expansion of the teen philanthropy and civic programs. Before beginning the application process, read all the information under the “Programs” tab before making your track selection. Applicants are encouraged to contact the JTF staff for consultation if they have questions before completing the application. Every teen completing the application will be contacted for an interview. "Launching a Life of Philanthropy"